Although I don’t get out as much as I ought to there is one place I visit each week that takes little effort and makes me feel great. It may be an imaginary place but for 75 minutes each week its real. I’m a self confessed Archers Addict and have the t-shirts to prove it. I also have this map framed up on the wall in the pantry area so if I ever need to remind myself of the geography I can. 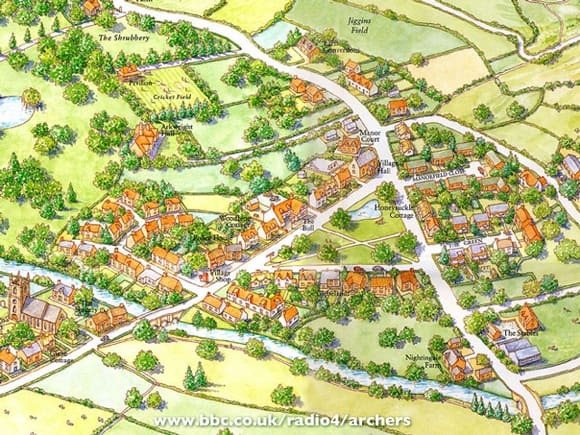 After 24 years of listening to The Archers I am so sad that Norman Painting who plays Phil Archer died yesterday. It’s impossible right now to contemplate life on the Archers without Phil but it looks like that’s going to be the case. Given the storyline right now it’s hard to imagine how they are going to deal with this since Phil is mentioned a great deal even if he hasn’t been heard. As in real life things will change now someone has died, life in Ambridge won’t be the same without Phil somewhere in the plot. Even moving 12,000 miles away from the BBC hasn’t stopped me listening to the Archers as it’s available to listen again on the Internet. Yet despite the opportunity to listen at any time, we try to listen to the omnibus edition on a Sunday morning just as I have always done. Strange but true! It’s these small parts of British life that thankfully we haven’t needed to leave behind. The power of the Internet and digital technology means that we can still enjoy much of what the BBC has to offer. I know for some people that is a little xenophobic towards New Zealand’s broadcasting capabilities but believe me folks if you were me you’d be doing the same too! Kiwi TV is truly dreadful although Radio NZ does have some interesting stuff to listen to some times. My favourite megabyte chomping pleasure right now is to watch Strictly Come Dancing each week off the BBC I-player. It’s glitz, glamour and car crash TV all in one. It’s been a while but I’ve finally read another book. Having lost my reading rhythm whilst I was away I knew I needed a favourite author to get back into the flow. Anne Tyler never lets me down for some pure escapism. 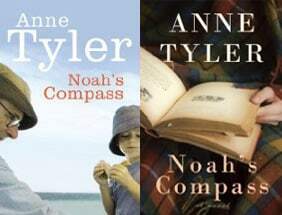 Noah’s Compass is another brilliant read from Tyler. You can the Guardians review if you like. It summarises the plot and what makes this book so great better than I ever could. All I will say that even though I finished the book a couple of weeks ago I still keep thinking about what it was that made Tyler finish the book the way she did. It’s not so much a twist in the tale but rather an outcome more in keeping with life for real. On one hand I admire that but on the other I’ve spent time wondering about the myriad of other ways she could have ended things. This is a typical Tyler trait and what I love most about her books. If you’ve not read one yet I thoroughly recommend any one. I’ve read them all and like them all equally. I’m now back into reading again although I have to say sticking with some easy to read books as there are too many other things I’ve been concentrating on. I’m re-reading Patricia Atkinson’s books about her life in France. I read her first book Ripening in the Sun when I was starting to realise that I was not enjoying being a rat in the rat race of life. It sparked my belief that it was possible to change your life and achieve anything you want. Re-reading them I’ve also been reminded that it takes hard work and dedication to really achieve. There are few quick fixes in life and whilst some of the lifestyle books, articles and documentaries would have you believe that you just need to dream and things will happen, in the real world it’s not like that. Yes, luck, help from others and a little bit of sunshine helps but in truth having the life you want takes energy, drive and motivation. All of that seems like, and is hard work. Back in the real world of Domestic Executive HQ, I’ve high hopes for a break in the rain this weekend. Lots to do outside and a momentous trip on Sunday to look forward to! Glad to see the bakers back in business. Enrolling for “Scrapheap Challenge” next. Just finished watching Strictly. What a fiasco! I won’t say more incase you haven’t seen it yet. I’ve been listening to the Archers for about 30 years but at the moment it’s more a case of dipping in and out rather than regular listening. It is sad about Norman Painting but how wonderful to be able to work right up to 2 days before departing this earth. That’s the way to go. PS Peter has bought me a legit lisenced copy of Windows 7 for £50 which is going on my pc as everyone else in this house has 2 screens anyway. l’ve never been a great archers fan myself, by I understand the sentiment of missing auntie beeb. I did try your suggestion of a UK web gateway for viewing iPlayer but alas it was simply not fast enough for me and I’m too much of a skinflint to pay for a faster connection since it’s already too expensive. We’ve done without Tv since we’ve been here. Couldn’t face all those terrible adverts.